You’ll be hard-pressed to meet a group of auto enthusiasts more dedicated to their vehicles than Land Rover owners. Whether off-roading trails worldwide or traversing inner city tarmac, Land Rover owners are very dedicated. This month we highlight Chris Walker, a UK native who’s now residing in Canada. Chris has traveled the world but always remains in close proximity to Land Rovers. Why the lifelong dedication and loyalty? Read on to find out. 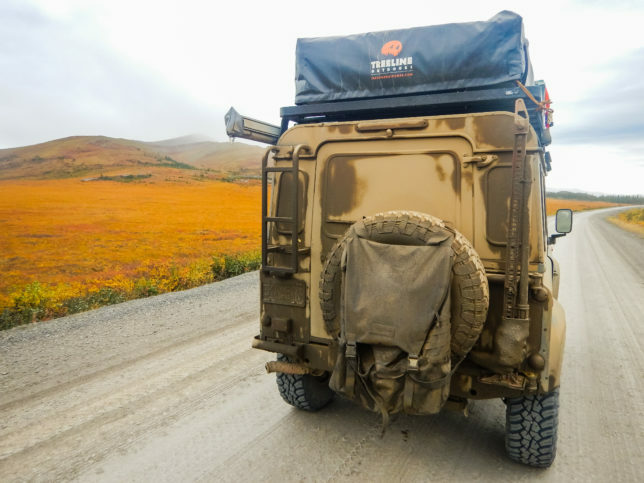 Northwest Territory fall colors and Dempster mud = a perfect combination. “Well, passion for the brand alone is a huge motivator and there was no way I was putting money into anything else until I had a Defender.” Chris says. Why not a newer Discovery or something else by Land Rover? “Well, I love the new vehicles. They have come so far and are so, so good at what they do. Their breadth of capability far outshines the likes of the older vehicles by Land Rover. Their engineering and technology allows them to truly go further than they ever have done and do lead the field. But, there is something to be said about an old Defender. It’s noisy, it’s cramped, it leaks, it’s slow, and it’s not all that comfortable. But, you have to experience one to truly understand how iconic and good it is.” As owners of two 25+ year-old Mitsubishi diesels, we get it! In stock form, the Defender is exceptionally capable. Some will argue it’ll outperform almost every other stock 4×4 out there. There’s something that makes it work so well. The lack of technology makes it exciting; it forces you to get reacquainted with the elements. Simple engineering requires skill and technique to achieve great things. Things that electronic traction aids take away from. “It is such an iconic vehicle, and every day I get in it I smile. I have to leave home earlier. It’s slower, I have to be more prepared, but that takes me back to the history of where it all came from.” Chris states. For him, it doesn’t seem to be a bother but rather, quite the opposite. A beautiful setting, the Haida Gwaii beach on Graham Island (British Columbia). Chris is originally from the United Kingdom and emigrated to British Columbia, Canada 15 years ago. While in the UK, he grew up just outside Stratford-upon-Avon, close to the home of Land Rover. He spent his young life in the mountains, on the roads, and in the fields continually exposed to one of the most iconic British car brands. Every day he’d see farmers, the locals in their old Defenders (often blue or green with a silver cap) with full of bails of hay, often towing the iconic British farm trailer from Ifor Williams Trailers. He’d spend almost every evening after school playing in the fields, riding around in old tractors and old series Land Rovers helping his best friend on the farm. Every photo is breathtaking on Haida Gwaii beach. That school boy passion extended with jobs that involved old Defenders and Discoveries to gain access to rural and mountains in Wales (searching for adventure and exploration with children in crisis care). Continuing on, Chris spent almost two years in Iceland, exploring the country, working, playing and having many opportunities to have fun in the iconic Icelandic Defenders toting their huge lifts, 44” balloon tires, snorkels, and true wild travel capabilities on the icecaps and through rivers. Moving to Canada put a damper on his passion, however. The Land Rover obsession was forgotten for a while until he stumbled across a job opportunity that unexpectedly presented itself. Chris got a lucky break in Canada and ended up being the safety liaison between Land Rover North America and Whistler Blackcomb on the press launch of the new Range Rover Evoque hosted in Vancouver and Whistler. His job was to ensure that guests and instructors from Land Rover were guided up Blackcomb Mountain each day for a couple for weeks during their program. 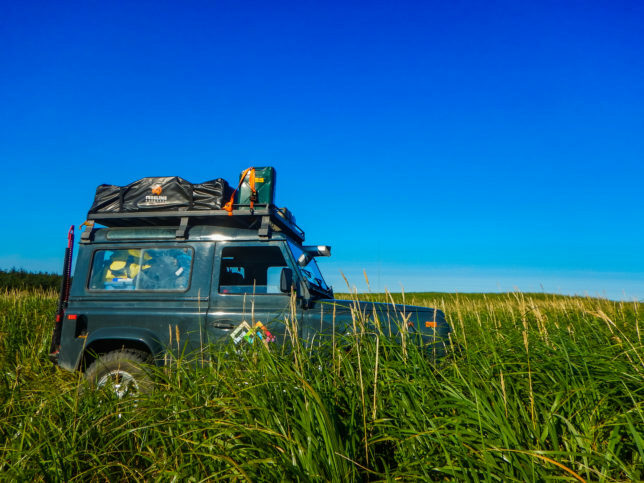 It was this program and the meeting of his now mentor and boss that spurred his current boss to invite him to try out for the respected Land Rover North America Mobile Events Team. Little did Chris realize how huge an opportunity had just been presented to him. The team comprises of around 16 people from all over NA and was made up largely of iconic names from North America’s camel trophy teams. Vast amounts of Land Rover experience and knowledge within the team has allowed him to be fully immersed from that point on. 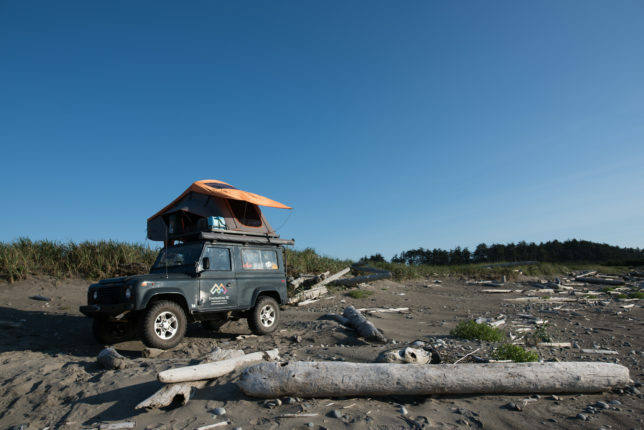 Product testing, launches, press events, dealer training, consumer ride and drives, training, instructing and so on, Chris finally found a way into the world he loved: anything with Land Rovers. You can never get enough of the NW Territory fall colors and Dempster mud. Chris’s Land Rover Defender 90 was built by Land Rover at the Defender production line under the order of the military sales division of Land Rover. A grand total of 840 were built for the Italian Carabinieri as police vehicles. They were unique that they used the Rover 2.0 -liter T16 DOHC gasoline engine. The Italian Carabinieri specified this engine due to high fuel taxation and the lack of diesel supplies at the time. Land Rover would build the Defender 90 on the regular production line in batches as they required very little component changes over the standard engine Defenders had at the time. To modify them for the Carabinieri, the different engine was mated to the existing R380 transmission and LT230 transfer case by way of different bell housings and engine mounts. Outside of that, a small ECU was placed under the passenger seat, a fuel pump and all the associated cooling and fluid pumping ancillaries were also added—very simple modifications. The T16 engine is a low horsepower engine that produces its power at higher RPM s and is great for zipping around town. It could also happily carry the Defender in excess of 70+ MPH. What it did lack, however, was low-down torque (compared to the standard 300Tdi diesel engine of its time). 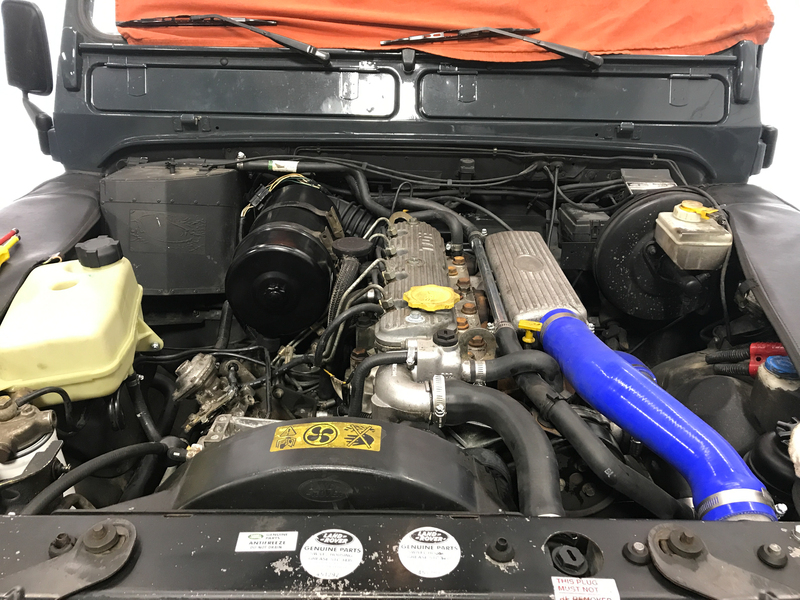 Chris wanted to convert the T16 to the 300Tdi because he liked the low-down torque of diesel. It made more sense to use a 300Tdi in his rig. The original engine was great for touring on the highway and in town but was more difficult off-road due to it’s “not-as-powerful” power band. Considering Chris’ passion is overland travel, the conversion makes sense. 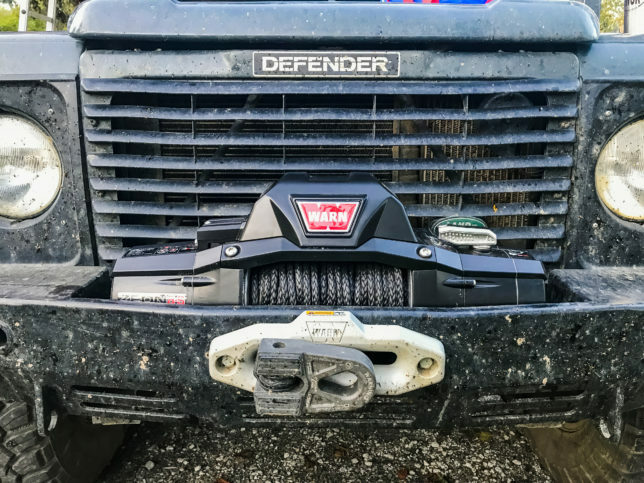 Almost every Defender in the UK is diesel. The sound of the engine rolling down the lanes and across the fields is iconic. It’s a stark reminder of the heritage at home. In reality, it’s a simpler engine to fix in the field, and that’s very important. 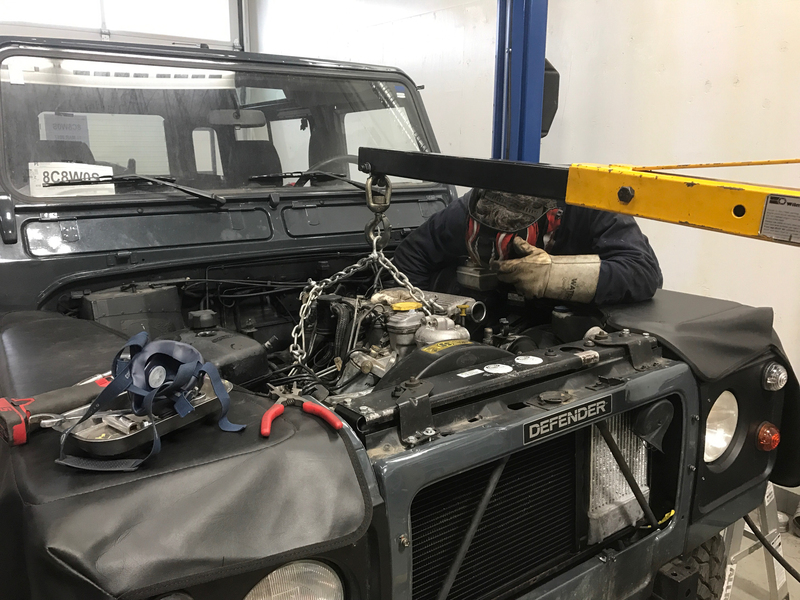 Welding new engine mounts on Chris’s Land Rover Defender 90. Finished photo of the 300Tdi engine conversion. A WARN ZEON 8-S winch adorns the front bumper of Chris’s Land Rover Defender 90. Chris has been fortunate enough to travel North America extensively over the last few years with Land Rover. Opportunities, such as teaching his overlanding business as part of the lead instructor team at BCOR and NWOR, have kept his work life full and adventurous. Alongside those varied work trips, Chris uses his Defender for fun and trail travels. 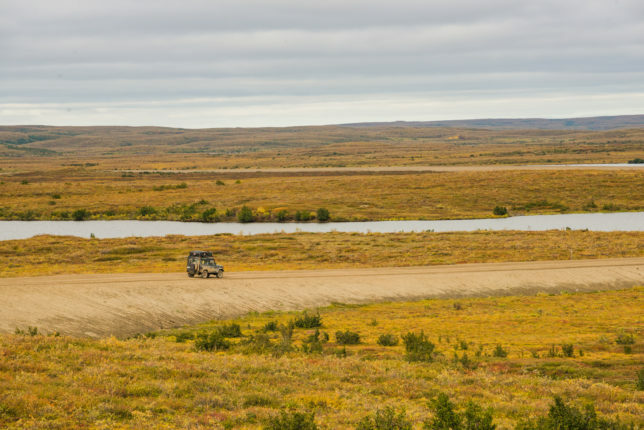 Most notably was a recent trip to the Arctic with his fellow adventurer, mentor, and Land Rover owner, Ray Hyland. 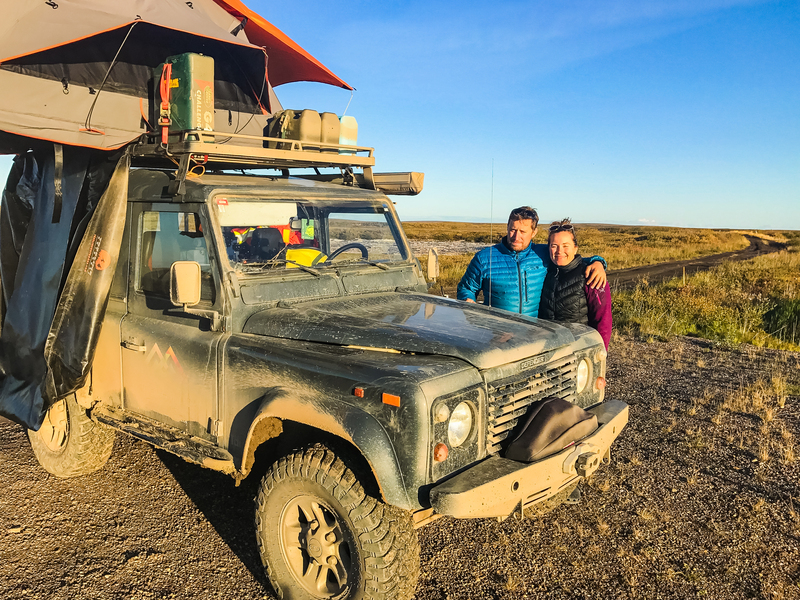 High Arctic success (Tuktoyaktuk 2017) with Natalie Weir. There is never a shortage of amazing shots from the High Arctic. 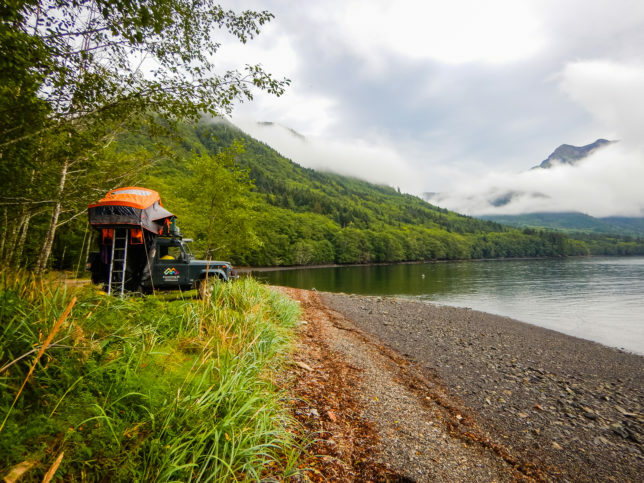 You can follow Chris’s Land Rover 90 build and adventures on his Overlanding BC website, his Christopher Walker Facebook page, or at his Christopher Walker Instagram page. Photos in this article courtesy of Chris Walker. 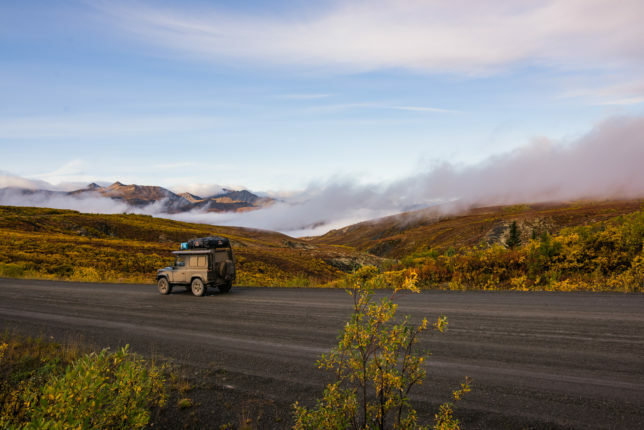 Crankshaft Chronicles is a regular series featuring peoples’ adventure vehicles. We’ll feature a new vehicle every month. 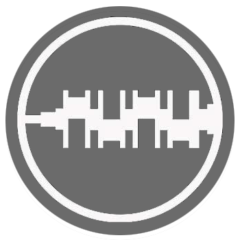 Want to be featured? Shoot us an email.